BLOT-LINE Yersinia IgA | TestLine Clinical Diagnostics s.r.o. Enter the product lot number to find Quality Certificate and IFU. Producer: TestLine Clinical Diagnostics s.r.o. 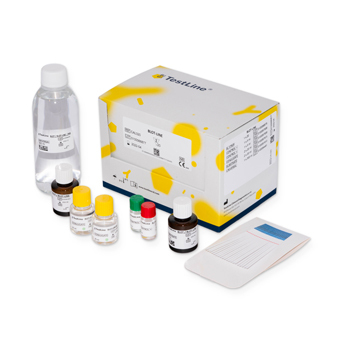 BLOT-LINE kit for the detection of specific IgA antibodies to recombinant antigens of Yersinia species in human serum or plasma. Do not hesitate and call us or fill in a query form and we will contact you soon. · Antigen used: combination of selected parts of the specific antigens of Yersinia spp. (YopB, YopD, YopE, YopH, YopM,YopN, LcrV, Ail, Invasin ) and species-specific antigens of Y.enterocolitica (YstB, YscM-Y.Ent) and Y.pseudotuberculosis (YscM – Y.Pst). · Recombinant antigens are transferred to the nitrocellulose membrane (i.e. to the respective BLOT‑LINE (BL) strips). · If specific antibodies are present in the sample, they will bind to the respective antigens. · The complex is labelled with Conjugate and detected through a colour reaction with substrate (BCIP/NBT). · The kit enables 20 tests. · Short incubation periods, total assay time: approximately 1.5 h.
· High sensitivity and specificity. · All reagents supplied are ready to use. · The kit may be used sequentially for smaller batches of samples (reagents are provided in sufficient quantities). · Positive and Negative controls included enabling validation of the tests. · BL strips equipped with conjugate control band and a control band indicating kits functionality and sensitivity. · Colour identification in compliance with antibody classes. · Identical (i.e. interchangeable) reagents (except for Conjugate) in all BLOT-LINE kits. · Evaluation of results – the intensity of the bands can be evaluated visually or by means of software (Immunoblot Software). · Confirmatory test to ELISA. 1. Dilute serum/plasma samples (1:51). 2. Pipette diluted samples and controls into the channels of the tray and insert the BL strips. 3. Incubate for 30 min at room temperature using a shaking apparatus. 4. Wash 3 times for 5 min. 6. Incubate for 30 min at room temperature using a shaking apparatus. 7. Wash 3 times for 5 min. 9. Incubate for 15 min at room temperature using a shaking apparatus. 10. Wash 2 times for 5 min in distilled water. 11. Dry the strips and evaluate results using the validation strip enclosed or using Immunoblot Software.